By Ed Runyan | March 23, 2018 at 12:10a.m. Trustee Dan Suttles says he was hopeful the public’s concerns about tanker trucks hindering firetrucks and ambulances from getting out of the township fire hall on state Route 7 would have stopped additional injection wells from being approved. 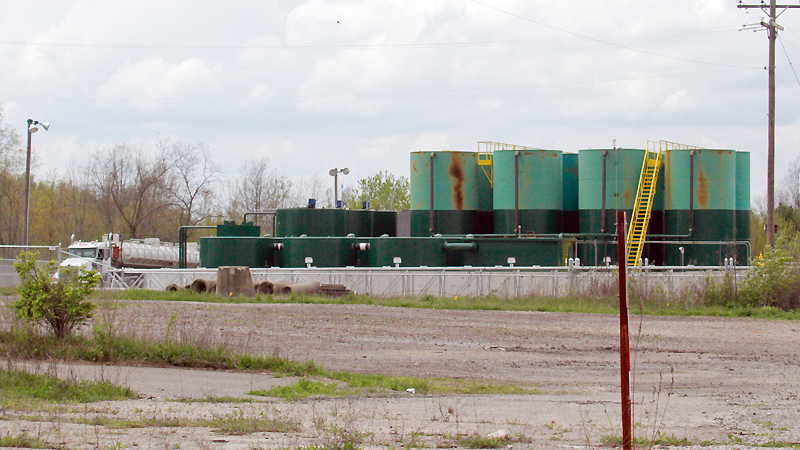 “But I guess we were wrong,” Suttles said this week when he learned that the Ohio Department of Natural Resources has approved three more wells for the site next to the Wyngate Manor manufactured home community about a mile north of Brookfield Center. The site uses a driveway being built off Route 7 to the north and west of Wyngate Manor. It is just north of the fire station and just south of Merwin Chase Road. The ODNR Division of Oil and Gas earlier approved construction of two wells on the site, but Highland Field Services has not begun to drill them yet. Suttles and Merwin Chase resident Jim Hennessy said residents plan to go to Columbus to continue to make state officials aware they do not want five injection wells close to homes that use well water and could overwhelm traffic patterns on the two-lane Route 7. Steve Irwin, ODNR spokesman, said the three additional wells would be quite similar to the two approved earlier. The permits say they would be drilled to a depth of 8,750 feet into the Knox through Rome geologic formations, but 18 construction conditions must be met before the injection wells can be used for injection. Injection wells are a means of disposal of the wastewater generated by the oil and gas industry. Irwin said having five wells is not viewed by ODNR to be any more dangerous to the community than two, and he said regulations require an ODNR official to be present during construction of injection wells. An investigation of the 2015 spill at the Kleese Development injection wells on Sodom Hutchings Road in Vienna suggested a proper liner was not installed under the concrete pad that is supposed to catch wastewater that escapes from holding tanks. At the time, ODNR regulations did not require ODNR to inspect the construction, an ODNR spokesman said in 2015. But such inspections do take place now, Irwin said. Hennessy said another rally is planned for April 5 on the Brookfield Green.